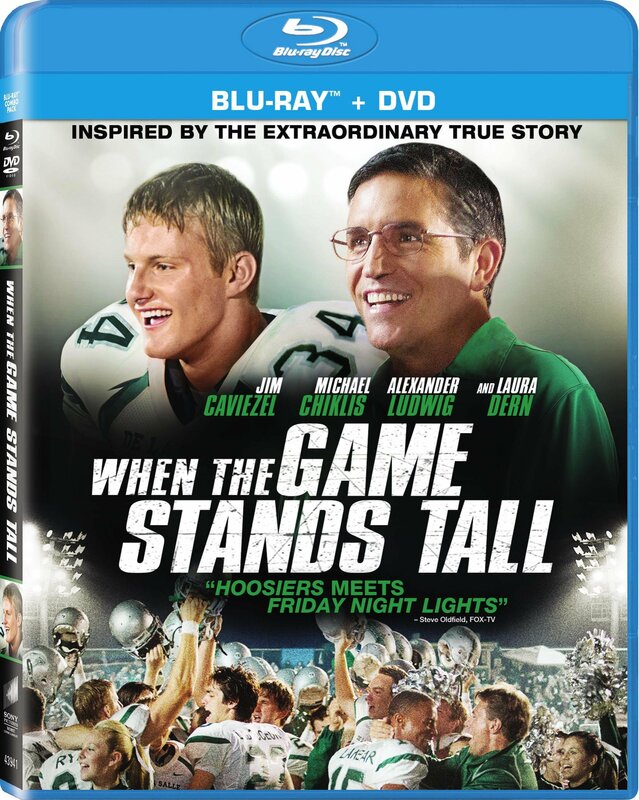 WHEN THE GAME STANDS TALL bonus features include six deleted and extended scenes, Director’s Commentary, and select scene commentary with Director Thomas Carter and Coach Bob Ladouceur. Also included are three all-new, behind-the-scenes featurettes, taking a look at the De La Salle Football program and Coach Ladouceur’s legacy, highlighting the challenges and excitement of bringing the story to the big screen, as well as the filmmakers’ approach to creating dynamic and exciting football sequences. The film is directed by Thomas Carter from a story by Scott Marshall Smith and David Zelon and a screenplay by Scott Marshall Smith based on the novel When the Game Stands Tall: The Story of The De La Salle Spartans and Football’s Longest Winning Streak by Neil Hayes. Cathy Schulman, David Tice and Thomas Carter serve as the executive producers with David Zelon as the producer. Inspired by a true story, WHEN THE GAME STANDS TALL tells the remarkable journey of legendary football coach Bob Ladouceur (Jim Caviezel), who took the De La Salle High School Spartans from obscurity to a 151-game winning streak that shattered all records for any American sport. When the streak is broken, and tragedy strikes the team, Coach Lad must teach his players – and the entire town – that it’s not about how you fall, but how you get back up. “Undefeated: Making WHEN THE GAME STANDS TALL” — A behind-the-scenes look at the challenges, excitement and triumphs of filming. “Gridiron Action” – A look at the dynamic approach filmmakers took to stage & film the exciting football sequences. “The Heart and Soul of a Program” — A look at the man behind the De La Salle Football Program. WHEN THE GAME STANDS TALL has a run time of approximately 115 minutes and is rated PG for thematic material, a scene of violence, and brief smoking. Follow WHEN THE GAME STANDS TALL on Twitter at @WTGST and on Facebook at: https://www.facebook.com/WhenTheGameStandsTall. Affirm Films is a division of Sony Pictures Worldwide Acquisitions (SPWA), a Sony Pictures Entertainment (SPE) company, dedicated to producing, acquiring and marketing films which inspire, uplift, and entertain audiences. Sony Pictures Entertainment (SPE) is a subsidiary of Sony Entertainment Inc., a subsidiary of Tokyo-based Sony Corporation. SPE’s global operations encompass motion picture production, acquisition and distribution; television production, acquisition and distribution; television networks; digital content creation and distribution; operation of studio facilities; and development of new entertainment products, services and technologies. For additional information, go to http://www.sonypictures.com.